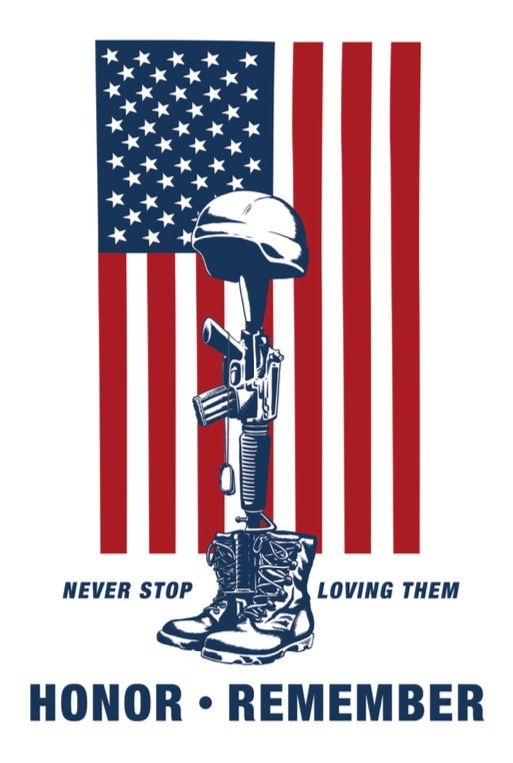 The Memorial Day Foundation is giving away a free 81/2 x 101/2 Memorial Day Window Flag professionally printed on coated paper to the first 500 people who email us their name and address by filling in the form below. 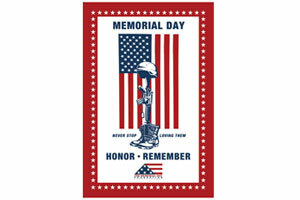 This Flag symbolizes the patriotic ideals of Memorial Day. The rifle with fixed bayonet pointing downward into the ground symbolizes a soldier who went down fighting, sacrificing their life for our country. The boots represent the final march of the last battle. The helmet and dog tags signify the fallen soldier. Collectively these form what is known as The Battlefield Cross: a symbol of a soldier who has perished on the battlefield. The flag as a backdrop symbolizes the Patriotism of our fallen heroes. This tradition originated during the Civil War when a musket was turned up side down and stuck into the ground to mark the spot where a comrade died, making it easier to find the body after the battle. Over time this image has been used in every conflict and has developed into more that a marker. It is erected to the fallen by their comrades in arms to show honor and respect for the brave souls who gave their lives in defense of their country.